Yesterday we provided you with costumes to dress like a turkey, but how about if you want to make one? Thanksgiving is THE holiday for yummy turkey and stuffing and gathering the whole family together, so we don't blame you for wanting to have the best and most delicious turkey around! Thankfully, you've got us. We don't just specialize in costumes. We also specialize in finding you tips for making the best turkey around. We know food is an absolutely integral part of the holiday, so we want yours to be the best one there! Whether this is your first time roasting a turkey or your fortieth, these hints and tips will help to make it the centerpiece of your best Thanksgiving meal ever. When you're ready to cook the turkey, locate and remove the giblet bag (save giblets to make Giblet Gravy). Rinse the bird, inside and out, with cold water and pat it dry with paper towels. Chop your favorite fresh herb -- such as rosemary, sage or tarragon -- and add it to softened sweet butter. To flavor the breast meat, and prevent it from drying out, gently loosen the skin from the flesh (using your fingers to avoid tearing) and pack the herbed butter underneath. Smooth out the skin with the palm of your hand. Tie the legs together with cotton twine for a prettier presentation at the dinner table. (See: Trussing and Carving a Turkey.) Cook With Care Place the turkey, breast-side up, on a roasting rack set in a disposable roasting pan. The rack will keep the turkey from frying in its own juices, and the disposable pan will save on cleanup. Preheat the oven to 450°F. 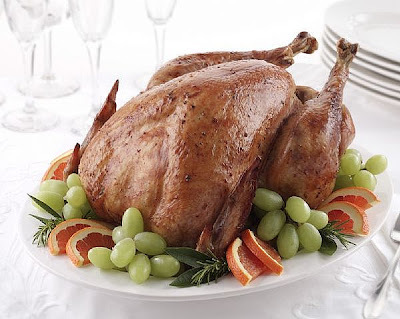 Brush the outside of the turkey with some vegetable oil and place it in the oven. The oil, along with the high heat, seals in the bird's natural juices. Roast the turkey for 20 minutes, then reduce the temperature to 350°F. Tent a piece of aluminum foil over the breast to prevent excessive browning. Baste the bird with pan juices or chicken broth every 15 minutes and continue to cook until done (about 10 to 15 minutes per pound). Add an additional 5 minutes per pound if the turkey is stuffed. Sometimes as little as 10 minutes per pound will result in the juiciest turkey. Do not season the turkey until the last 30 minutes of cooking. Salt draws out moisture, so seasoning toward the end of roasting time will reduce drying. When the turkey is cooked, its temperature should read 180°F. Do not rely on plastic doneness indicators or leave-in thermometers -- neither are substitutes for instant-read thermometers, which, when inserted into the thigh meat, will take a quick and exact reading. If you don't have a thermometer, make an incision in the skin between the thigh and breast. The juices should run clear with no trace of pink. When the turkey is done, remove it from the oven and let it sit for at least 15 minutes; this will make it easier to carve. Then simply carve, serve, and eat your fabulous creation! For Turkey and Thanksgiving costume ideas, check out www.halloweenadventure.com! Happy Turkey Day!